- The wing sauce served at Christopher’s is super hot. For a milder sauce when preparing it yourself, select your favorite “heat” wing sauce. - Test the oil to see if it’s hot enough by holding on to the edge of the tofu and letting only a tip of the tofu touch the oil. The oil is ready when it bubbles as the tofu makes contact with it. - A rice flour coating tends to make whatever you fry extra crispy. It’s a good choice for this recipe. 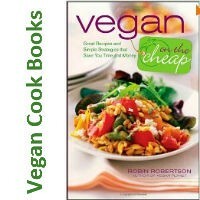 Shared by Chef Sarah Elise from her book Beginner’s Vegan Guide: Restaurants, Recipes and Resources. Recipe created by Christopher’s, Boston, MA. 1. Dredge the pieces of tofu through the flour, then dip in the milk and coat again in the flour. 2. Heat the oil in a deep non-stick frying pan or wok. 3. Place the battered tofu into the hot oil. Fry until brown and crispy. 4. Remove tofu and place into a stainless steel bowl. Then pour the desired amount of hot sauce over the tofu and mix until it is all evenly coated. 5. Serve with celery sticks and enjoy! 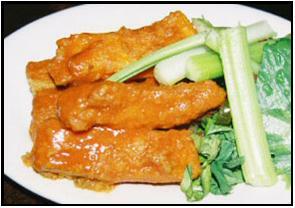 Let us know what you think of this easy vegan recipe: Tofu Buffalo Wings!